Houthi rebels on Friday seized power in Yemen and dissolved the country’s parliament as they announced a series of constitutional decrees drafted by the powerful shiite militia, Al Arabiya News Channel reported. One of the decrees mandated the establishment of a transitional national council that would replace Yemen's parliament. Supporters convening in the capital Sanaa also announced that that the new body would be tasked with electing a presidential council. 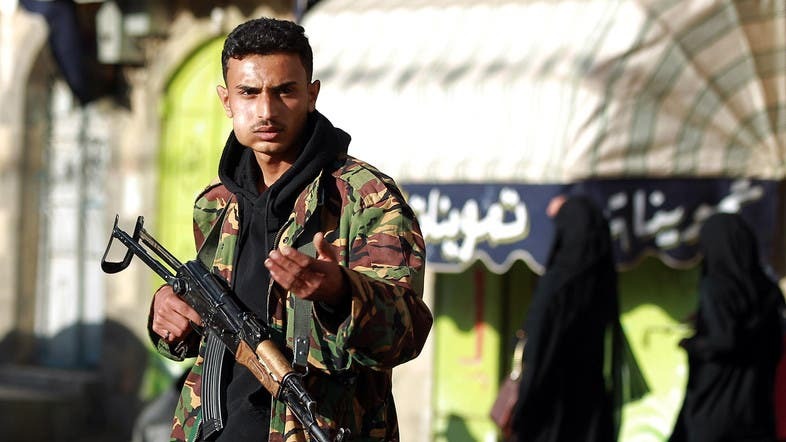 An amended version of an already drafted constitution will be put to a vote, supporters and members of the Shiite militias told a gathering in Sanaa. 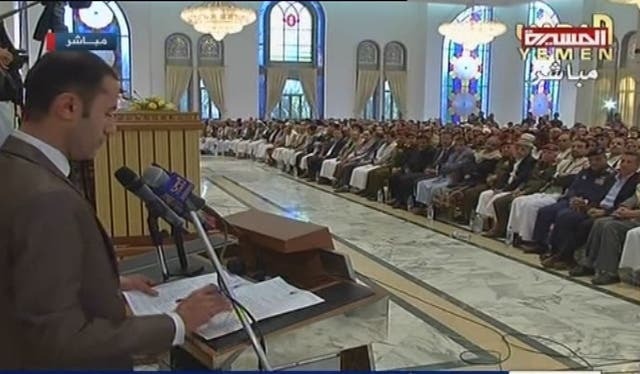 The rebels, backed by Iran and influential members of the former regime of President Abdullah Saleh, have also set a two-year period in which the transition of power would be complete, Al Arabiya News Channel reported. The Houthi rebels also announced the formation of a so-called “supreme revolutionary committee” to appoint local committees that will administer local provincial affairs. The decrees have been met with resistance from a number of factions in Yemen. Activists accused political parties and Jamal Benomar, the United Nations Special Adviser on Yemen, of colluding with the Houthi rebels, the Al Arabiya News Channel reported. In the southern city of Taiz, protestors gathered to denounce the Houthi takeover and Yemen’s Council of Revolutionary Youth refused to accept the decrees and called to resist it. The U.S. State Department has condemned the Houthi move to dissolve the parliament, spokeswoman Marie Harf said, but added that Washington will continue to work with Yemen's counterterrorism forces. The United Nations, meanwhile, said it is alarmed by what it described as a power vacuum in Yemen. He added that U.N. special envoy to Yemen Jamal Benomar was now returning to the Yemeni capital Sanaa because of the escalating crisis. Manuel Almeida, a London-based expert on Yemen told Al Arabiya News: “It is also about time for Yemen’s Western backers, especially the U.S. and Britain, to recognize that Iran’s multifaceted support for the Houthis is far more than a conspiracy theory. Yemen has now become another Lebanon, another Iraq, where an armed militia seems to be more powerful than the army. The country’s defense and interior ministers, along with head of security, attended the gathering held in the Republican Palace in Sanaa. But Al Arabiya News Channel quoted sources in Sanaa as saying that Defense Minister Mahmoud Mahmoud al-Subaihi was forced by the Houthis to attend the gathering and that he actually rejects their move. It is also about time for Yemen’s Western backers, especially the U.S. and Britain, to recognize that Iran’s multifaceted support for the Houthis is far more than a conspiracy theory. “When the movement took over the capital in September, they met very little resistance, which cannot be explained only by the dire state of Yemen’s armed forces. There was a deliberate intention,” Almeida wrote in an email statement. “Another related and key question is where former President [Ali Abdullah] Saleh, who still has plenty of influence within the army, really stands in relation to all this,” Almeida noted. Citing a “trusted source close” to Saleh, the report pointed to close coordination between Saleh and the Houthis to design the action plan for an eventual takeover of power. “It is clear that there was some collaboration between pro-Saleh factions and the Houthis but there were some signs lately that that collaboration could be giving way to a divorce. The way this relationship goes could prove decisive,” Almeida added. Yemen has been embroiled in confrontations between the Houthis and demonstrators who opposed their takeover of the capital Sanaa in 2014. After what he described as a deadlock in negotiations with the Houthis, Yemen’s President Abdrabuh Mansur Hadi resigned his post in January and his cabinet followed in suit. Al Arabiya’s bureau chief in Sanaa, Hamoud Munassar, says Saleh is “still observing” the unfolding the situation in Yemen. Munassar said that while the Houthis enjoy support in some areas, they have strong rejection in others, such as the western province of Maareb, where tribal gunmen have not allowed them to enter. Munassar said the latest development could escalate violence, which could lead to halt of oil production.